Ladies 14K Yellow Gold Genuine Diamond Flower Bangle Bracelet .65CT 8MM 7"
Ladies Necklaces. Browse All Ladies Chains. Quality Diamond Jewelry For Less. Ladies Pendants. Earring Shape / Style. A elegant designer diamond bangle bracelet is crafted in14K Yellow Gold (8.9 gram ) with0.65ct sparkling genuine diamonds. A Gift That Will Leave Her Awestruck ! 1 Bangle, 1 Authenticity Certificate. Precious/Artificial Jewellery. Precious Jewellery. 0.56 Cts Round Brilliant Cut Natural Diamond Bangle In 14K Gold. Know Your Bangle Size . A Gift That Will Leave Her Awestruck ! Precious/Artificial Jewellery. Precious Jewellery. 1 Bracelet, 1 Authenticity Certificate. Know Your Bangle Size Natural Diamonds. Natural/Synthetic Diamonds. A Gift That Will Leave Her Awestruck ! Precious/Artificial Jewellery. Precious Jewellery. Round & Baguette. Pave 2.11 Cts Natural Diamonds 14K Rose Gold Bracelet - YouTube. 1 Bracelet, 1 Authenticity Certificate. A Gift That Will Leave Her Awestruck ! Precious/Artificial Jewellery. Precious Jewellery. 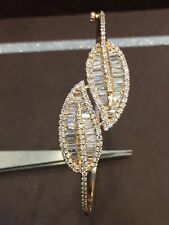 2.93 Cts Round, Pear, Marquise Cut Diamonds Bracelet In Fine 14K Gold. Round, Pear, Marquise. 1 Bracelet, 1 Authenticity Certificate. D for Diamond B775 Girls Silver Diamond Set Cross Christening Bangle. Learn About Diamonds. Heart Shape. Just Bling. Hip Hop Fashion Jewelry. Round Shape Pave. Gold Chains. Hide Gallery View. These are all 100%genuine natural brilliant round diamonds set an Invisible Pave Setting. With Baguettes in 18kt White Gold. 75ctw. 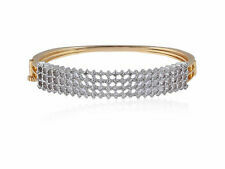 Clean, classy, elegant and sophisticated is this diamond open bangle bracelet. It’s made of solid 18kt brilliant white gold and is very ergonomic and stretchy so its comfortable to wear. A Gift That Will Leave Her Awestruck ! Precious/Artificial Jewellery. Precious Jewellery. 1 Bracelet, 1 Authenticity Certificate. Know Your Bangle Size Natural/Synthetic Diamonds. White Gold. Price May Vary. Elegant and gorgeous, this magnificent triangle flex bangle is crafted in14K Yellow Gold and showcases0.50 CT of brilliant round diamonds. The diamonds on this piece have the clarity ofVS2-SI1 and color ofG-H. Style Bangle. Clasp Type Bangle Bracelet. Total Carat Weight (TCW). 40. Exact Carat Total Weight. 40. Natural round Cut diamond. Main Stone Creation Natural. Country/Region of Manufacture United States. Perfect Gift For All Occasions ! 1 Bracelet, 1 Authenticity Certificate. Know Your Bangle Size Yellow Gold. Natural/Synthetic Diamonds. •Custom Jewelery Designing - We Can Manufacture Your Jewelery Design. (Shape: Rose/ Round. Main Stone: Diamond. Never enhanced, or lab treated. All of our gold is 100% 14K or 18K SOLID gold. Nothing less. Very competitive wholesale prices. c) No middleman. Style Bangle. THIS LOVELY DESIGNER 18KT WHITE GOLD 15.6GRAM flexible CUBE AND BAR LINK STYLE BANGLE BRACELET IS ADORN WITH APPROX 1.46CTW IN ROUND SPARKLING DIAMONDS OF G-H-COLOR, VS-SI CLARITY. THE BANGLE OPENS ON THE SIDE FOR EASY ON OFF ABILITY. Precious/Artificial Jewellery. Precious Jewellery. Pave 1.46 Cts Natural Diamonds Bracelet In Fine 14K Gold. 1 Bracelet, 1 Authenticity Certificate. Know Your Bangle Size Natural Diamonds. Natural/Synthetic Diamonds. Ladies 10K White Gold Real Diamond Princess Designer Bangle Bracelet 1/2 CT 7"
Ladies Necklaces. Browse All Ladies Chains. Quality Diamond Jewelry For Less. Ladies Pendants. Enchant the one you love with this elegant and stylish designer bangle bracelet. This exquisite bracelet is fashioned10K White Gold. A spectacular diamond bangle in 18k white gold with 3.15 carat of premium quality diamonds. Diamond is also the gift for the 60th Diamond Wedding Anniversary. The April birthstone, diamond, in addition to being a symbol of everlasting love, was once thought to bring courage. 14 KT White Gold. Channel Invisible Set Diamonds in Front. Style Bangle. Channel Set Diamond. Cut princess. Total Carat Weight (TCW) 2.50 CT. Wear Alone, or pair w/ Other Gold Bracelets for a Layered Look. Total Carat Weight (TCW) 0.10. Style Bangle. Hallmarks: 14k. Diamond Color H. LOT#0101460. Main Stone Diamond. Condition: very good condition. Unique and attractive, this beautiful Double Heart flex bangle is crafted in14K Yellow Gold and showcases0.45 CT of brilliant round diamonds. The larger heart has a iced heart with a caged heart around it and the smaller one has an iced heart with a matte finish heart around it. Diamond Shape: Round & Baguette. Style: Bangle. This particular bangle features a unique design with diamonds. This bangle can fit up to a 8" wrist and is5mm wide. Clasp Type: Push Lock with Safety Catch. A spectacular diamond bangle in 18k rose gold with 3.00 carat of premium quality diamonds. Diamond is also the gift for the 60th Diamond Wedding Anniversary. The April birthstone, diamond, in addition to being a symbol of everlasting love, was once thought to bring courage. Style Bangle. This fine bracelet features 5 round diamonds with total weight of 0.17 carat. Diamonds are H color, SI 1 clarity with excellent shine. 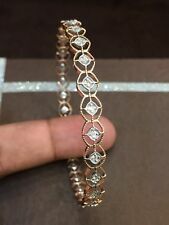 Diamond Color H. Type Bracelet. Primary Stone Diamond. (Shape: Baguette / Round. Main Stone Shape Baguette. Stone Shape Baguette. Carat Weight: 1.74 CT. Main Stone: Diamond. Very competitive wholesale prices. c) No middleman. Never enhanced, or lab treated. Ladies 10K Yellow Gold Genine Diamond Cuff Bangle Open Bracelet 1/2 CT 6.25"
Browse All Ladies Chains. Diamond Chains. Ladies Necklaces. 10K/14K/18K Gold Chains. Quality Diamond Jewelry For Less. Ladies Pendants. Gemstone Chains. Earring Shape / Style. Here we have a beautiful and petite diamond bangle bracelet crafted in solid 18k white gold featuring 3 beautiful and fine channels of princess cut diamonds. The bangle is secured with a very strong push clasp and safety latch. A Gift That Will Leave Her Awestruck ! Precious/Artificial Jewellery. Precious Jewellery. Classy 0.39 Cts Round Brilliant Cut Diamonds Bracelet In 14K Rose Gold - YouTube. 1 Bracelet, 1 Authenticity Certificate. (Style: Bangle. Carat Weight: 0.38 CT. Never enhanced, or lab treated. All of our gold is 100% 14K or 18K SOLID gold. Nothing less. Very competitive wholesale prices. c) No middleman. Main Stone: Diamond. (Style: Bangle with Double Lock Clasp. Main Stone: Diamond. Shape: Round. Very competitive wholesale prices. c) No middleman. Style Bangle. Never enhanced, or lab treated. All of our gold is 100% 14K or 18K SOLID gold. Roberto Coin 18K Rose Gold Diamond Bracelet. 18k rose gold bracelet weighs 8.2g. Bracelet has ruby signature. Bracelet stamped "RC 18K". Style Bangle. Bracelet is large size. Bracelet fits a 7.5" wrist. Style Bangle. - Diamonds are J color and SI1 clarity. Clarity SI1. - Bracelet is 8.2mm wide. Diamond Color J. Main Stone Shape Round. - 128 round brilliant cut diamonds (3.33ctw). Secondary Stone Diamond. Elegant and magnificent, this gorgeous Round 3 Stone flex bangle is crafted in10K Yellow Gold and showcases1.50 CT of brilliant round diamonds. The diamonds on this piece have the clarity ofVS2-SI1 and color ofG-H.
WOMEN'S LADIES DOUBLE HEART GENUINE NATURAL REAL DIAMOND BANGLE BRACELET 7.5"
Clasp Type Bangle Bracelet. Style Bangle. Yellow Gold Finish Over Fine 925 Sterling Silver.The Bracelet consists of Genuine Clear Diamonds in Micro Pave Setting. Bracelet Has Snap On Clasp With Two Safety Clip On Each Side. A Gift That Will Leave Her Awestruck ! Precious/Artificial Jewellery. Precious Jewellery. 1 Bracelet, 1 Authenticity Certificate. Know Your Bangle Size 0.27 Carats Round Brilliant Cut Natural Diamonds Bracelet In 14K Gold - YouTube. (Style: Bangle. Never enhanced, or lab treated. All of our gold is 100% 14K or 18K SOLID gold. Nothing less. Very competitive wholesale prices. c) No middleman. Main Stone: Diamond. Shape: Round. Material: 9ct yellow gold. BANGLE SPECS DIAMOND SPECS. Clarity: SI1. A Gift That Will Leave Her Awestruck ! Precious/Artificial Jewellery. Precious Jewellery. 1 Bracelet, 1 Authenticity Certificate. Know Your Bangle Size Stunning 0.84 Cts Natural Diamonds Bracelet In Fine 14K Gold. Enchant the one you love with this elegant and stylish designer bangle bracelet. This exquisite bracelet is fashioned10K Yellow Gold. The7MM center dazzle with five clusters of genuine diamonds attached to3MM gold bangle bracelet. This bracelet is set with thirty-four natural Round Brilliant Diamonds. These diamonds are H color, SI clarity and weigh a total of. 85 carat. Style Bangle. Diamond Color H. Main Stone Creation Natural. (Style: Bangle. Never enhanced, or lab treated. All of our gold is 100% 14K or 18K SOLID gold. Nothing less. Main Stone: Diamond. Shape: Round. Very competitive wholesale prices. c) No middleman. Mens Womens New 1/2Ctw Genuine Real Diamond Cuff Bangle Bracelet Sterling Silver DETAILS Stock : SD055090 Brand : USDIAMONDKING Model : DIAMOND BANGLE BRACELET Gender : LADIES/WOMEN'S Material : STERLING SILVER Dimensions : LENGTH : 6 INCH Sale Price:$189.99 Shipping Cost : 00 This auction is for an Attention Grabber, New Big Look 14k Yellow Gold Finish Genuine Diamond Bangle Bracelet. Bracelet is made with 14K Yellow Gold Finish Over Fine 925 Sterling Silver.The Bracelet consists of Genuine Clear Diamonds in Micro Pave Setting. Size The Bracelet is 6 inch and fit to any 5 inch to 5.5 inch wrist. Thick bold with 5 mm Width. Total Weight Of the Diamonds Are 0.55ctw. Weight of The Bracelet Is 14 Grams. Bracelet Has Snap On Clasp With One Safety Clip On Side. GRAB EVERYONE'S ATTENTION , BE A TREND SETTER...WITHOUT HURTING YOUR WALLET.